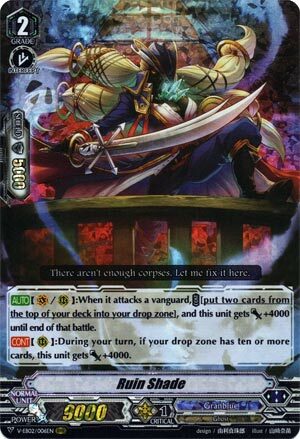 [AUTO](VC/RC):When it attacks a vanguard, COST [put two cards from the top of your deck into your drop zone], and this unit gets [Power]+4000 until end of that battle. [CONT](RC):During your turn, if your drop zone has ten or more cards, this unit gets [Power]+4000. RRR treatment again. Ah well. Anyhoo. What we have is the usual toolbox making shenanigans, although I must say that the bad habit of spamming mill can only be encouraged by this. Especially since she can turn herself into a 17k attacker for the filling of 8 cards in the drop to 10. Aside from that any criticism I can make applies to the old Ruin Shade. You generally don’t need to load the drop zone constantly: you just want key pieces to revive and that’s it. Unfortunate that nothing in Standard Granblue searches and toolboxes really but you can always draw the key pieces, guard and then revive.